19 micron at 4 !!! Full Accoyo! PROVEN FEMALE OF SUPERIOR OFFSPRING! Superior Gray Genetics on Board! GREAT GENETICS * PROVEN PRODUCER! ZEPPELIN DAUGHTER! Silver Gray Dam! BRED TO 2012 AOBA FLEECE CHAMP. Full Peruvian ~ True Black! 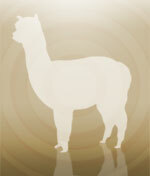 SOLD CONGRATS TO ALPACAS ON THE HORIZON!